We live in a time of massive disruption. To respond to that disruption we need to not only change the products and services we build and how we build them, we also need to change the way we change. We need a new approach to corporate transformation. We have all seen the data showing how fast market incumbents lose their position relative to the good old slow days, and how many of the current crop of leading companies will still be around in the next decades (spoiler: it’s not going be pretty). We see it in the headlines on a daily basis; Toys R Us is only the latest once dominant retail giant to fall, arguably at the hands of e-commerce trends and Amazon in particular. One take away from that is fairly straightforward. Change or die. There is no alternative. Take a look at our recent webinar with Jeff Gothelf. We examined some of the challenges to driving change inside large enterprises and the principles we highlight in our upcoming book, The Case for Change. Authors Sonja Kresojevic and Jonathan Bertfield discuss their upcoming book "The Case for Change" with host Jeff Gothelf in this new webinar from Sense & Respond Press. 28+ Innovation Experts Sharing Their Strategies and Tactics That Work. Including our very own Sonja Kresojevic. Check out her contribution to the conversation focusing on Experimentation at Scale: Are We Getting there? There’s enough of that out there already, and it’s rarely useful. 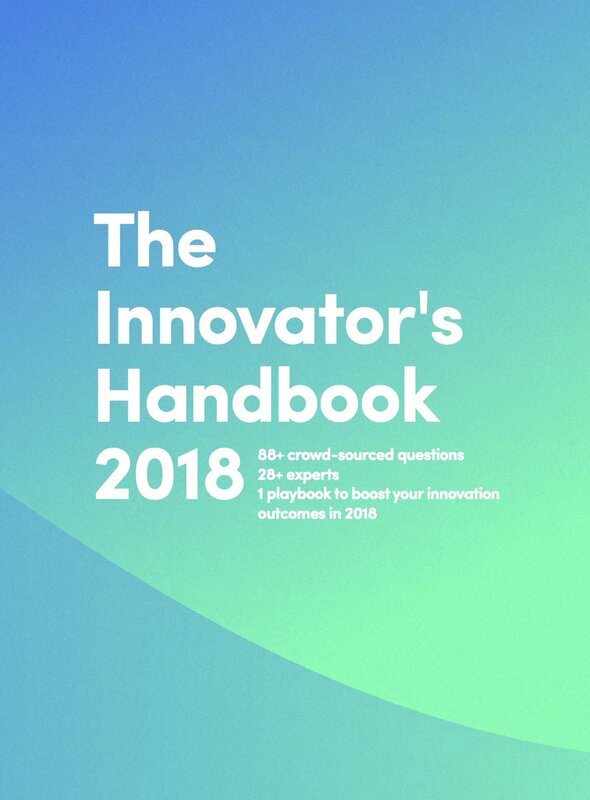 The Innovator's Handbook 2018 - Virtual Summit gives you cross-industry best practices, and ready-to-use and easy-to-implement advice from in-the-trenches experts...and you can attend on any device, from anywhere you have an internet connection. Jonathan presented a workshop on the Lean Enterprise Transformation Journey on the last day of this conference. You can the slides from that workshop here. Overall this was a fascinating event. An inspiring mix of companies and organizations represented and really focused set of speakers and workshops. It was also amazing to see the depth of the innovation ecosystem in Toronto. There is a huge wave of tech activity happening in the city. We were so excited by the conference that we are attending all of the Innov9ors conferences in 2018! 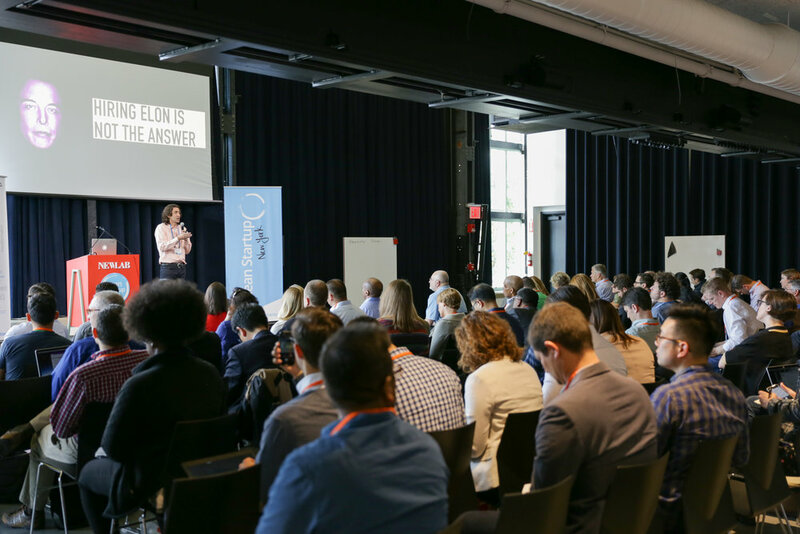 Lean Startup Week is one of the leading conferences focusing on implementing Lean and Agile practices at scale. 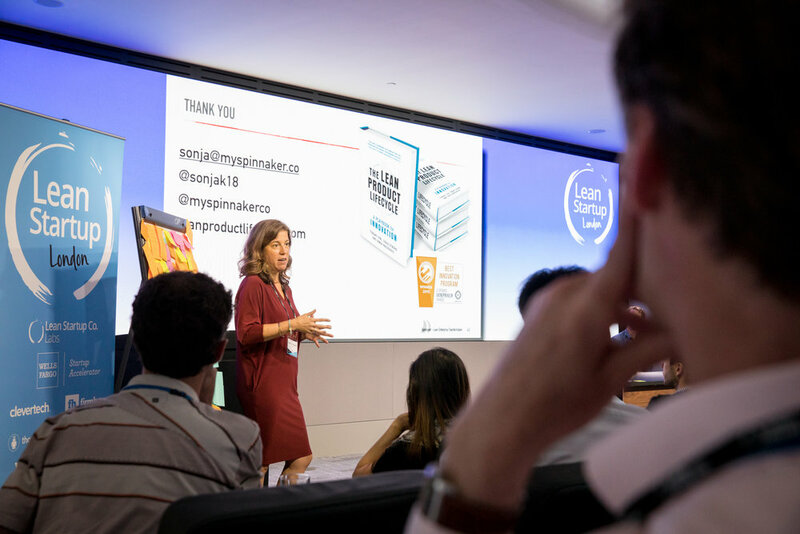 Sonja presented our Lean enterprise Transformation Journey workshop here with teams attending from Proctor and Gamble, the UK Government Cybersecurity team and many more. Sonja facilitated a workshop at the event focusing on the Lean enterprise Journey. Large enterprises facing disruption struggle to transform quickly enough—from becoming more innovative to improving processes, culture, and ways of working. Transformation programs are often linear, multi-year engagements not focused on continuous learning and improvement. 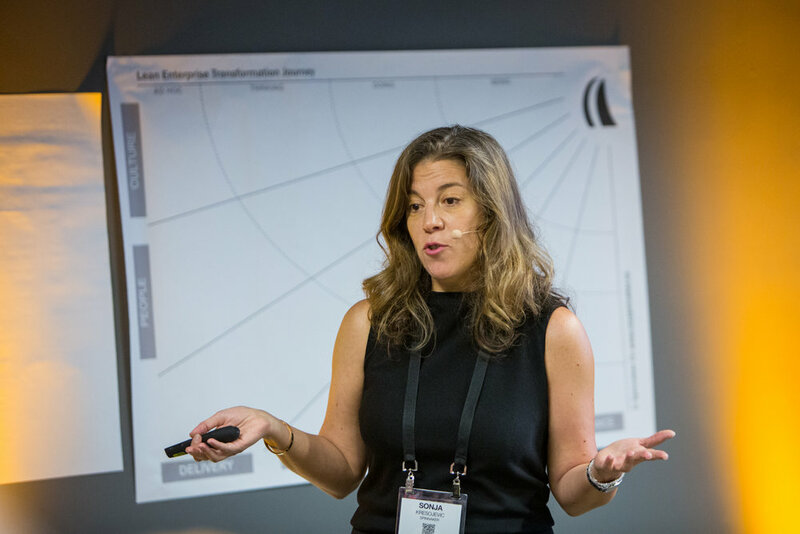 In this workshop, Sonja shared lessons learned from our award-winning Lean Enterprise transformation program at Pearson that will enable you to kick off and significantly accelerate your own organization's Lean Enterprise journey. She uncovered how proven approaches embodied in Lean Startup, Agile, and Adaptive Portfolio Management can be combined into a single cohesive framework that can serve as catalyst for powerful shifts in your organization. 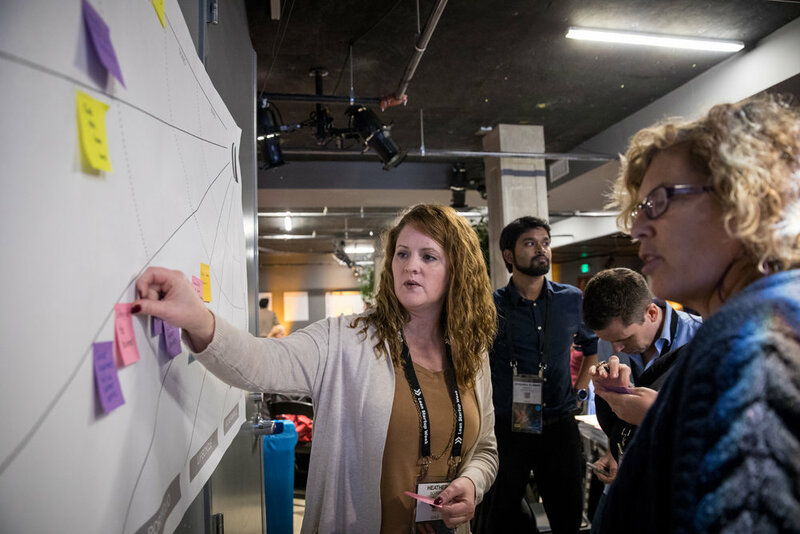 Attendees left the workshop with an example of transformation roadmap ready to stimulate wide-ranging conversations and drive focused action, as soon as they returned to their office. If you don't have a strategy in place for deploying Lean Startup, you'll end up with siloed efforts that fail to shift the organizational culture or capacity for experimentation. 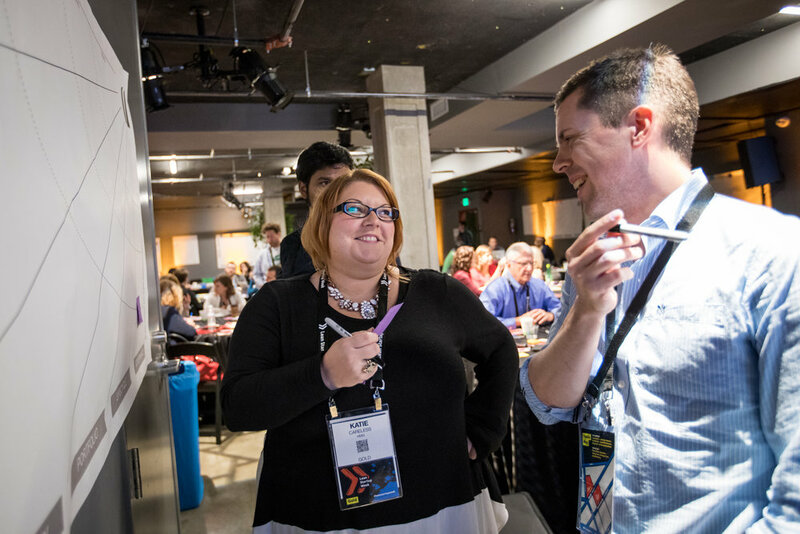 In his session, Jonathan unpacked the connection between strategy, experimentation, and execution using core tools from the Lean Startup method. 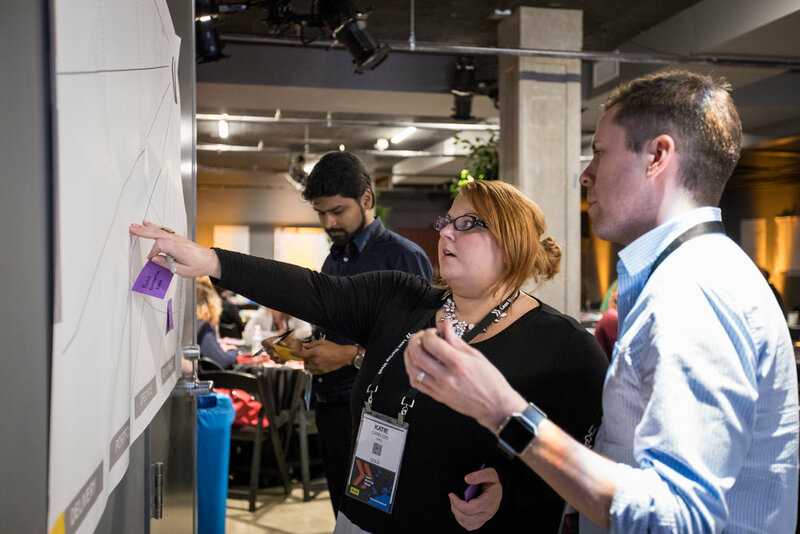 Attendees were able to unpack their business’ strategic hypothesis and use that as the starting point for defining an experimentation road map. Jonathan was interviewed by Brian Ardinger of the I/O Podcast. Jonathan and Brian discuss Innovation Marketplace concept and the state of Lean Enterprise transformation initiatives. It’s always tricky deciphering attempts at innovation when we are looking in from outside of large enterprises. Timothy Lee helps us peel back some layers from some prominent examples in his post on Vox exploring How Amazon innovates in ways that Google and Apple can’t. What are some of the key takeaways for anyone challenged with delivering growth through innovation inside their company? Innovation at scale is hard to pull off. Some of the best thinking happening today in the innovation space is focused on training product teams to develop a mindset using Lean Startup, Customer driven development, fast learning, agile development approaches. I’m a big fan of all of those and spend my days consulting and training large organizations to do just that. But this is a classic case of necessary but not sufficient. Instead of just focusing on the mindset of teams selling their innovation ideas into the portfolio pipeline, we have to bring a concurrent focus to changing the mindset of decision makers who are the targeted buyers; The senior executives writing checks to fund the best ideas that emerge. In other words, for innovation to succeed at scale inside a large enterprise, we need an efficient innovation marketplace. Video courtesy of the Lean Startup Co. Applying Lean Startup seems to be the magic formula for innovation success in the enterprise, as we hear about it a lot. But do we actually know what works and what doesn’t work when it comes to applying Lean Startup in established companies? 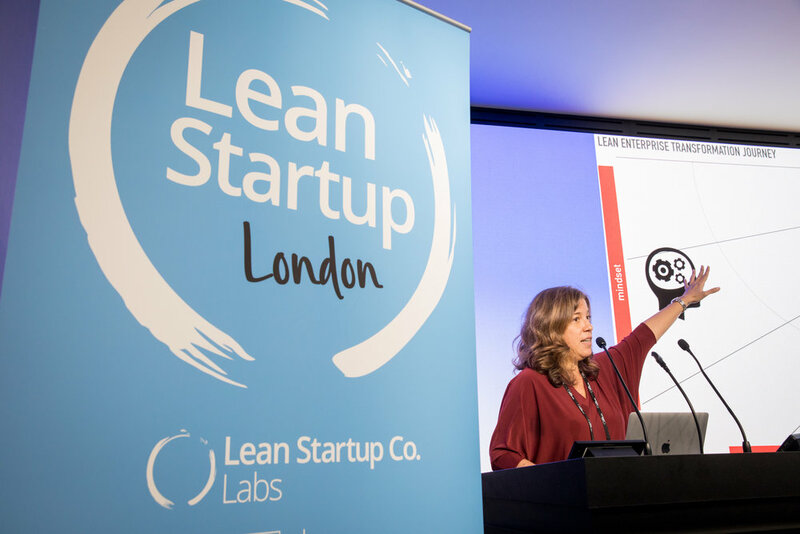 To answer these important questions we talked with experts who work with big companies, as well as innovation practitioners from within these organizations – both applying the Lean Startup methodology [including Sonja Kresojevic]. “We have developed a set of criteria that we use to evaluate the investment, so when product teams have an idea, they submit that idea to a Product Council who use the framework to evaluate the idea and make an investment decision. And obviously the criteria used in early stage investment are very different; you care about a very different set of KPI’s. It’s all very data and evidence driven, you look at early business models and it’s all based on the build, measure, learn cycles. Sonja prsented a session at the Goto Conference in London in Feb 2016. In her speech she outlines how principles and practices of Agile, Lean Product Lifecycle and active portfolio management can help companies navigate disruption, increase innovation and transform their portfolios and why mindset, leadership and cultural changes are key to success. Building great products and getting them to market fast is a great passion of mine. Nothing gets me more fired up each day than waking up every morning knowing that my team is infusing our company with entrepreneurial spirit, delivering agile and lean startup principles at scale, via our very own process: our global Product Lifecycle. The Product Lifecycle (PLC) is our award-winning framework for product development and investment, designed to allow Pearson to become lean, agile and nimble, and help us stay ahead in a fast-moving industry.